Remove snow and ice with this SaltDogg 1400601SS Electric Drive Salt and Sand Spreader that uses two different 12V DC motors for ultimate power. The stainless steel hopper can carry up to 54 cu. ft. of material and can spread at a width of 30 ft. And the chute assembly can be adjusted using an upper or a lower set of holes. Motor: Two different 12V DC motors power the spinner and auger. Hopper Capacity: Carry up to 54 cu. Ft. of salt and/or sand in your hopper. Spread Width: Spread salt and /or sand on a range of 3-30 feet. Mounting: No drilling necessary for mounting. Feed Gate: Accurate adjustment is offered with the lever operated feed gate with a friction lock. Material Hopper: Made out of 304 stainless steel for durability. External Deflector: Complete directional spread control is available through the adjustable deflectors. Chute Assembly: Adjustments using an upper or lower set of holes can be made. 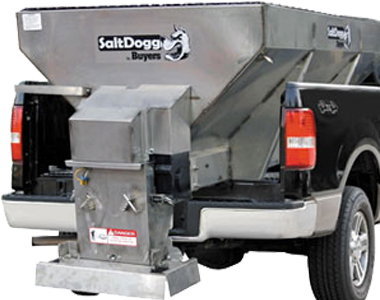 Ask us about the SaltDogg 1400601SS Electric Drive Salt & Sand Spreader. Please no repair questions. Your Q&A may be posted to SnowblowersAtJacks.com to help other shoppers, like you, with their purchasing decisions. Thank you.